Received March 5, 2019; Revised March 21, 2019; Accepted March 26, 2018. Traumatic diaphragmatic injuries (TDIs) are a rare complication in thoraco-abdominal trauma. The diagnosis is difficult and if left untreated, TDI can cause traumatic diaphragmatic hernia (TDH). Through an injured diaphragm, the liver, spleen, stomach, small intestine, and large intestine can be herniated to the thoracic cavity, but pancreatic herniation and pancreatitis are quite rare in TDH. This paper reports a case of pancreatitis developed by additional trauma in a patient with asymptomatic chronic TDH. A 58-year-old male visited the emergency department with a left abdominal injury after a fall 6 hours earlier. The vital signs were stable, but the amylase and lipase levels were elevated to 558 U/L and 1,664 U/L, respectively. 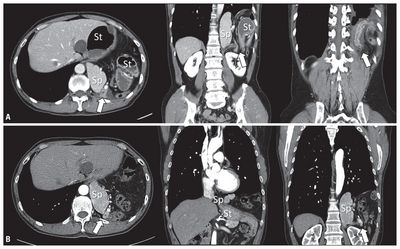 Abdominal computed tomography (CT) revealed a left diaphragmatic hernia and an incarceration of the stomach, pancreatic ductal dilatation, and peripancreatic fatty infiltration. Additional history taking showed that he had suffered a fall approximately 20 years ago and had an accidentally diaphragmatic hernia through a chest CT 6 months earlier. A comparison with the previous CT revealed the pancreatitis to be caused by secondary pancreatic ductal obstruction due to the incarcerated stomach. For pancreatitis, gastrointestinal decompression was performed, and after 3 days, the pancreatic enzyme was normalized; hence, a thoracotomy was performed. A small ruptured diaphragm was found and reposition of the organs was performed. This paper reports the experience of successfully treating pancreatitis and pancreatic hernia developed after trauma without complications through a thoracotomy following gastrointestinal decompression. Diaphragmatic hernia is the movement of abdominal organs into the thoracic cavity through a defect of the diaphragm. This has congenital causes, such as Morgagni’s hernia or Bochdalek hernia or trauma, infection, and surgery . Of these, traumatic diaphragmatic hernia (TDH) occurs when a traumatic diaphragmatic injury (TDI) is not treated properly and is observed in 1–5% of blunt trauma cases . TDH identification may be delayed for a long time if the symptoms associated with herniation are absent or insignificant but the development of fatal complications, such as intestinal obstruction, strangulation, and incarcerated hernia, may be associated with high mortality due to shock and acute respiratory distress; its mortality rate can reach 25–66% [3–7]. Until now, there have been few reports of pancreatic herniation and pancreatitis in TDH. This paper reports a case of pancreatitis developed by additional trauma in a patient with asymptomatic TDH. A 58-year-old male visited the emergency department (ED) with left flank pain. He slipped on a ladder while working 8 hours earlier, and his left upper abdomen hit the floor. Initially, the pain was not severe, but the intensity of pain increased from 6 hours before admission, and additional pain radiating to the back was generated. The intensity of pain at the time of admission to the ED was 8 on the visual analogue scale. The physical examination revealed a blood pressure of 118/82 mmHg, pulse rate of 102 beats/min, oxygen saturation of 98%, and he was afebrile. In the complete blood count results, the hemoglobin concentration was 13.7 g/dL. The liver function, renal function, and electrolyte levels did not show abnormal findings, but the amylase and lipase levels were elevated to 558 U/L and 1,664 U/L, respectively. On the chest X-ray, there was no evidence of rib fracture, but the air-fluid level was observed in the left thoracic cavity (Fig. 1). Abdominal computed tomography (CT) showed no evidence of free air or free fluid collection in the abdominal cavity, and no hemothorax or pneumothorax in the thoracic cavity; however, the stomach, spleen, pancreas, large intestine, and fatty tissue were herniated into the left thoracic cavity (Fig. 2A). Bulging of the proximal stomach and the incarceration of the herniated gastric body, pancreatic ductal dilatation, and peripancreatic fat infiltration were observed, but there was no evidence of direct pancreatic injuries. Through additional medical history taking, the patient reported that he had fallen from a height of approximately 10 m approximately 20 years earlier, and he then suffered intermittent left abdominal pain, but did not seek medical assistance. Six months earlier, chest CT has been performed to find the cause of his frequent cough, revealed left diaphragmatic hernia of the spleen, colon, and pancreas, but there was no evidence of the herniation of stomach or pancreatitis. However, he did not have any further examination or treatment because he had no symptoms (Fig. 2B). The TDI is believed to have occurred because of trauma approximately 20 years earlier that was exacerbated by the trauma that occurred a few hours earlier. Compared to the previous CT images, the cause of elevated pancreatic enzyme was judged to be secondary pancreatitis caused by an obstruction of the pancreatic duct due to incarcerated stomach rather than a direct injury of the pancreas or obstruction of the bile duct. There was no immediate suspicion of sepsis due to pancreatitis, and the surrounding inflammation was not severe. Gastrointestinal decompression was first performed through fasting, nasogastric tube insertion, and aspiration of the gastric contents rather than urgent surgery. After 1 day, the symptoms and abdominal radiographic findings improved, and the amylase and lipase levels decreased to 354 U/L and 433 U/L, respectively. On the third day, the pancreatic enzyme was normalized and an operation for the TDH was performed; a thoracotomy was decided because of the concerns regarding adhesion in the thoracic cavity. Adhesion between the thoracic tissue and stomach, spleen, pancreas, colon, and fat tissue was observed, and a ruptured diaphragm was found in the posterior when the adhesion was removed. The size of the ruptured diaphragm was not large, and an additional incision was needed to restore the abdominal organs. The patient was discharged 11 days later and he has been receiving outpatient care without any special complications. TDI is associated with a 3–7% of thoracic and abdominal trauma, and symptoms, such as dyspnea, chest pain, consciousness disorder, and shock, can occur. TDI rarely occurs alone and 44–100% is associated with fatal abdominal and thoracic injuries; therefore, early diagnosis is important, but it is difficult to recognize it early because it can be masked by the accompanying trauma [3,8–10]. Because the injured diaphragm does not heal naturally, movement of the abdominal organs to the thoracic cavity through the ruptured diaphragm occurs by the breathing motion and the pressure difference between the thoracic cavity and abdominal cavity . The diagnosis of TDH is often dependent on the occurrence of symptoms associated with thoracic herniation. Fatal complications, such as intestinal obstruction or incarcerated hernia can be recognized immediately because they cause serious symptoms. On the other hand, the diagnosis can be delayed by months without special symptoms. Chronic TDH can be delayed by up to 48 years; however, 80% of patients reported hernias within 3 years [5–7]. TDH occurs well in the left side because the right diaphragm may be protected by the liver, and the left diaphragm may be weaker than the right diaphragm. Nevertheless, right TDH has also been reported up to 33%, so right diaphragmatic hernia should not be overlooked [12,13]. The liver and the large intestine are mainly herniated in right TDH, and the stomach, spleen, large intestine, and small intestine are mainly herniated in left TDH. On the other hand, herniation of the pancreas is quite rare. Up to now, the diaphragmatic hernia of the pancreas reported in the literature has occurred in paraesophageal or congenital diaphragmatic hernia. As far as we know, pancreatic hernia by trauma, as in this case, occurred in only two cases, and a left hernia of the pancreas has not been reported [14–18]. The injury mechanism of pancreatitis in a TDH a direct damage of the pancreas by repetitive herniation, obstruction of the bile duct or blood flow due to intestinal incarceration, and direct pancreatic obstruction [19–21]. In this case, only 6 months earlier, CT showed that the body and tail of the pancreas were herniated without pancreatic ductal dilatation and inflammation and there was no evidence of the herniation of stomach. On the other hand, post-traumatic CT demonstrated an incarcerated stomach, dilatation of pancreatic duct, and fat infiltration above the diaphragmatic lesion but there was no evidence of parenchymal lesions in the pancreatic head below diaphragm. Therefore, elevated pressure of a diaphragmatic defect due to an incarcerated stomach caused pancreatic duct obstruction followed by pancreatitis. The gastrointestinal decompression based on these findings contributed to the rapid improvement of symptoms and the effective reduction of pancreatic enzymes. TDH requires urgent surgical treatment after diagnosis because of the potential associated fatal complications . A thorough thoracotomy is preferred in chronic TDHs because of the possibility of adhesion, but simultaneous abdominal or thoracic-abdominal access may be needed if strangulation of the herniated organ is present . Treatment of pancreatitis in TDH has not been established. Previous studies reported that the results and prognosis of postoperative surgery were good in cases where surgery had been performed after the treatment of pancreatitis; these results were also confirmed in the present case [14,15,24]. Nevertheless, since TDH complications can be associated with high mortality rates, the precedence between conservative treatment for pancreatitis and surgery for strangulation should be considered carefully on a case-by-case basis. In conclusion, TDI is a rare complication in thoraco-abdominal trauma and the diagnosis is difficult. Untreated TDI can cause TDH. Through the ruptured diaphragm, liver, spleen, stomach, small intestine, and large intestine can be herniated into the chest cavity, but the herniation of pancreases is quite rare in TDH. This paper reports the successful treatment of pancreatitis and pancreatic hernia developed after trauma without complications through a thoracotomy following gastrointestinal decompression. This work was supported by the 2017 Yeungnam University Research Grant. Fig. 1. Chest X-ray of the patient. Air-fluid levels are seen in the left thoracic cavity. Fig. 2. CT of the patient. Abdominal CT of the visit day show the findings of left lateral diaphragmatic hernia of the stomach, spleen, colon, and pancreas (arrows). In addition, bulging of the proximal stomach and incarceration of the herniated gastric body are observed, and pancreatic ductal dilatation, and peripancreatic fluid collection are seen (A). CT taken 6 months earlier, diaphragmatic hernia of the stomach, spleen, colon, and pancreas are shown in the left thoracic cavity, but no evidence of prominent inflammation of pancreas or herniation of stomach is seen (B). St: stomach; Sp: spleen; CT: computed tomography. Miller PA, Mezwa DG, Feczko PJ, Jafri ZH, Madrazo BL. Imaging of abdominal hernias. Radiographics 1995;15:333-47. Johnson CD. Blunt injuries of the diaphragm. Br J Surg 1988;75:226-30. Chughtai T, Ali S, Sharkey P, Lins M, Rizoli S. Update on managing diaphragmatic rupture in blunt trauma: a review of 208 consecutive cases. Can J Surg 2009;52:177-81. Shah R, Sabanathan S, Mearns AJ, Choudhury AK. Traumatic rupture of diaphragm. Ann Thorac Surg 1995;60:1444-9. Shackleton KL, Stewart ET, Taylor AJ. 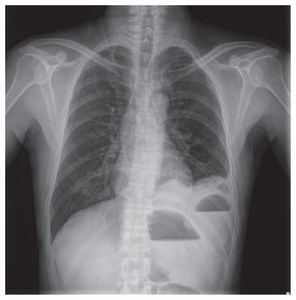 Traumatic diaphragmatic injuries: spectrum of radiographic findings. Radiographics 1998;18:49-59. Reber PU, Schmied B, Seiler CA, Baer HU, Patel AG, Büchler MW. Missed diaphragmatic injuries and their long-term sequelae. J Trauma 1998;44:183-8. McHugh K, Ogilvie BC, Brunton FJ. Delayed presentation of traumatic diaphragmatic hernia. Clin Radiol 1991;43:246-50. Powell BS, Magnotti LJ, Schroeppel TJ, Finnell CW, Savage SA, Fischer PE, et al. Diagnostic laparoscopy for the evaluation of occult diaphragmatic injury following penetrating thoracoabdominal trauma. Injury 2008;39:530-4. Reina A, Vidaña E, Soriano P, Orte A, Ferrer M, Herrera E, et al. Traumatic intrapericardial diaphragmatic hernia: case report and literature review. Injury 2001;32:153-6. Shanmuganathan K, Killeen K, Mirvis SE, White CS. Imaging of diaphragmatic injuries. J Thorac Imaging 2000;15:104-11. D’Souza N, Bruce JL, Clarke DL, Laing GL. Laparoscopy for occult left-sided diaphragm injury following penetrating thoracoabdominal trauma is both diagnostic and therapeutic. Surg Laparosc Endosc Percutan Tech 2016;26:e5-8. Scaglione M, Pinto F, Grassi R, Romano S, Giovine S, Sacco M, et al. Diagnostic sensitivity of computerized tomography in closed trauma of the diaphragm. Retrospective study of 35 consecutive cases. Radiol Med 2000;99:46-50. Thillois JM, Tremblay B, Cerceau E, Dehaye B, Gigou F, Destable MD, et al. Traumatic rupture of the right diaphragm. Hernia 1998;2:119-21. Chevallier P, Peten E, Pellegrino C, Souci J, Motamedi JP, Padovani B. Hiatal hernia with pancreatic volvulus: a rare cause of acute pancreatitis. AJR Am J Roentgenol 2001;177:373-4. Coral A, Jones SN, Lees WR. Dorsal pancreas presenting as a mass. AJR Am J Roentgenol 1987;149:718-20. Dinc T, Kayilioglu SI, Coskun F. Late onset traumatic diaphragmatic herniation leading to intestinal obstruction and pancreatitis: two separate cases. Case Rep Emerg Med 2015;2015 549013. Saxena P, Konstantinov IE, Koniuszko MD, Ghosh S, Low VH, Newman MA. Hiatal herniation of the pancreas: diagnosis and surgical management. J Thorac Cardiovasc Surg 2006;131:1204-5. Tabaka FB, Nigro SJ, Nora E. Traumatic diaphragmatic hernia complicated by acute traumatic pancreatitis. Ill Med J 1952;101:269-70. Kafka NJ, Leitman IM, Tromba J. Acute pancreatitis secondary to incarcerated paraesophageal hernia. Surgery 1994;115:653-5. Henkinbrant A, Decoster O, Farchakh E, Khalek W. Acute pancreatitis caused by a voluminous umbilical hernia. Case report. Acta Gastroenterol Belg 1989;52:441-7. Oliver MJ, Wilson AR, Kapila L. Acute pancreatitis and gastric volvulus occurring in a congenital diaphragmatic hernia. J Pediatr Surg 1990;25:1240-1. Gourin A, Garzon AA. Diagnostic problems in traumatic diaphragmatic hernia. J Trauma 1974;14:20-31. Lee SJ, Koo WM, Moon SC, Kim DS, Kim CH, Chae SS. Clinical evaluation of traumatic diaphragmatic injuries. Korean J Thorac Cardiovasc Surg 1997;30:1005-9. Tonini V, Gozzi G, Cervellera M. Acute pancreatitis due to a Bochdalek hernia in an adult patient. BMJ Case Rep 2018;2018 bcr-2017-223852.